I was born in Tacoma, WA, graduated from Stadium H.S. 1950. Attended Central Bible College, Springfield, MO and awarded B.A. degree. Pastored six churches (Wisconsin, Ohio, Washington, California and Minnesota) and served in several executive positions for the Assemblies of God. Now, “Pastor Emeritus” of Calvary Christian Assembly, Seattle, since 2013 (I served as pastor of CCA 11 years – 1974-1985 and Pastor to Senior Adults (2000-2012). Ruth was born in Milwaukee, WI, and graduated H.S. there in 1952. 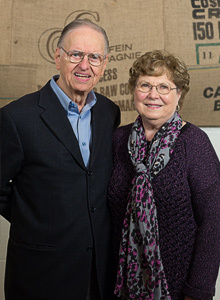 Ruth – Oct. 13, 1954 We met at Central Bible College, Assemblies of God’s headquarter theological training institute. After a year dating, we married in Milwaukee, WI. Son, Doug – Active in Bethany Christian Assembly, Everett. General Manager, Cascade Precision, Mukilteo. We have three grandchildren and five great-grandchildren. Golf, walk, play table games, and socialize with friends. Salmon and most any meat, vegetables, Desserts. “The work is His. Our work is to rest in Him.” Hudson Taylor, pioneer missionary to China.